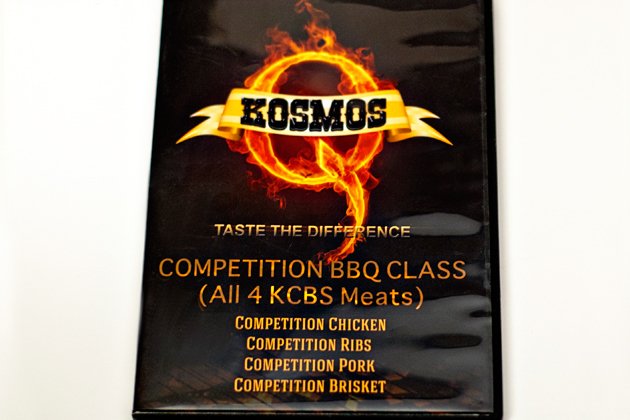 When my friend Darian "Kosmo" Khosravi offered me the opportunity to review his competition barbecue class on DVD I jumped at the chance. I've used his injections, soaks, and rubs at home and in competition for years and I've always been very pleased with the results. Darian and his wife have been very successful on the competition trail, so I was very excited to see how he uses his own products to produce award-winning barbecue. The popularity of competition barbecue continues to spread like wildfire, and the caliber of the competitors is growing with that popularity. In an effort to flatten the learning curve and catapult themselves to the awards stage competitors have turned to classes put on by proven champions. These classes are effective, but they have several problems. First, they are offered only a few times a year and they fill up very quickly. Next, they are conducted in-person (often as a mock competition) at a venue, which is time-consuming. They also tend to be very expensive, and the travel and accommodations greatly compound that expense. Lastly, it's a one-time deal, so you have to rely on note-taking for later review. Given all this, a quality class on DVD is long overdue. The first thing that struck me about Kosmo's class is the production quality. It's professional, polished, and superbly well done! Don't take my work for it, take a look for yourself. The best production in the world is pretty much useless if the content doesn't measure up. This another area where these videos really shine. Kosmo and his wife are very relaxed and they do a great job of presenting all of key techniques in a well-organized and concise manner. In addition to the basic steps, Kosmo gives some great tips and equipment recommendations along the way. There are some short repeated scenes in each video, but that is understandable, as each needs to stand on its own. I watched the entire set twice, but I wanted to put the class to the test in a real competition. I decided to use Kosmo's methods (including his products) at the Colorado BBQ Challenge in Frisco, Colorado. I was on a team and another cook was handling the chicken category, but the ribs, pork and brisket were prepped, seasoned, and cooked Kosmo-style, with few exceptions. We were catering at the event and I forgot to soak the ribs (still 8th place), and I did deviate with my own sauce and I built my boxes a little differently. We took fourth overall in a tough field of 60 teams, so the results of this real-world test clearly speak for themselves. If, like me, you've been interested in taking a competition class, but it's been cost-prohibitive, I cannot recommend Kosmo's class on DVD any more highly. You'll get proven instruction by a true barbecue professional. This class will undoubtedly improve your scores and get you more walks to the stage. 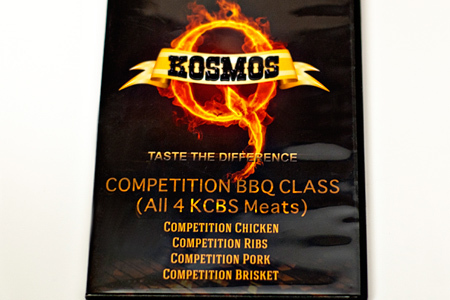 Note: The class is offered in a two DVD set that covers all four KCBS meats (chicken, ribs, pork, and brisket), and also on an individual DVD for each meat. Disclaimer: The DVD set was provided to me at no charge, but the review is entirely my own. Nice review, John. You hit on some positives (key points) and gave an honest take on the dvd's. Thanks for doing the review for us. As a backyard cook looking to learn more, the dvds are a bit pricy as a whole. But for $100 bux I'd buy the chicken and ribs vids. I think $100 is cheap vs learning yourself at $$$ per mistake. Anonymous - You've got that right! I agree with Anonymous. $100 is cheap for all that expert knowledge! My last class cost me well over $1000 by the time I figured in the travel, lodging, & food costs associated with the trip to attend the class... And then I had to "re-organize" / "re-do" my notes once I got home due to things being presented at a real fast pace at the class... This is a DEAL!! Love this article man, and would like to add it to my Competition BBQ Classes page as a link if that's cool? The results surely do seem to speak for themselves! So many times, it's tough for teams to get the time or money together to attend live classes. This DVD set may fit the bill in those cases - sure seems to anyway! Hey John! Great review. Cool if I post a link to it on my Competition BBQ Classes page at the blog? Just got the video. Going to try some of the pointers at this weekend's cook-off. I will post the outcome and reviews.